A large swelling on the vocal cord that typically occurs unilaterally—that is, without a similar swelling on the opposite cord. The term vocal polyp is somewhat imprecise, but vocal polyps can be distinguished from a similar kind of swelling, vocal nodules, in at least two ways: 1) polyps tend to be larger than nodules; 2) polyps occur unilaterally or are markedly larger than an injury of the opposite vocal cord, whereas nodules occur in pairs and are usually similar in size. Both vocal polyps and nodules are caused at least in part by vibratory trauma, due to vocal overuse that is acute (with polyps) or chronic. A vocal polyp disrupts the voice’s clarity and other capabilities by interfering with accurate approximation of the vocal cords during phonation. A polyp may also add mass to the vocal cord, thereby dropping the pitch range available to the voice. Polyps may be referred to as hemorrhagic, pedunculated, and so forth. The translucency of the left vocal cord polyp (right of image) and the patient's long history of hoarseness together suggest chronicity. Initial voice therapy to manage the patient’s obvious “vocal overdoer” status. Approximately two months later, new injury from persistent vocal overuse. 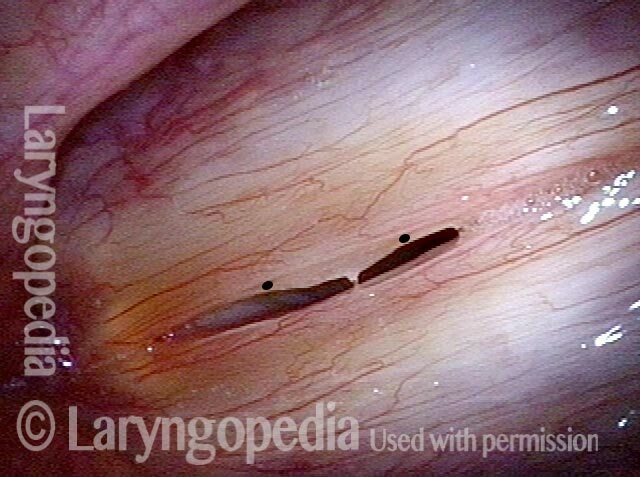 An operatic baritone has a chronic left vocal cord polyp (right of image), and small contact reaction, right cord. Phonation, open phase of vibration, upper middle voice, showing obvious margin elevation of the left cord (right of image). Voice is hoarse. Maximum closed phase of vibration, showing polyp-induced gap, causing air wasting and hoarse voice quality. Sixth day after microlaryngoscopic removal of the polyp. Note the red, 2-millimeter “wound” where the polyp was removed. At extremely high falsetto, open phase of vibration, showing uniform width of glottic chink. Voice is normal, even at this revealing, high pitch. Closed phase of vibration, high falsetto, shows equal vibratory amplitude on both sides (no stiffness) and excellent match of the cords. Chronic polyp on the right vocal cord (left of image), with ectatic capillaries, unresponsive to voice rest and therapy. Seven weeks after surgical removal and spot coagulation of ectatic capillaries. The margins of the vocal cords now match, and capillaries are normalized. Mucosal vibration is preserved to the highest reaches of the singing range. At this pre-phonatory instant, one can see that muscle memory is keeping the vocal cords slightly apart, suggesting the need for additional speech therapy. Prephonatory instant, standard light. 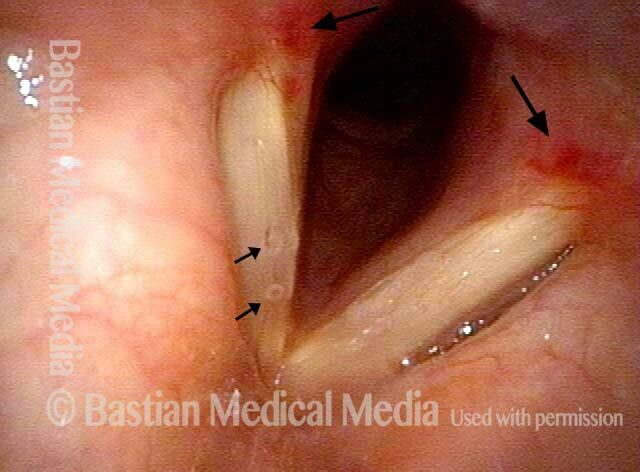 The space between the vocal cords is larger than necessary to accommodate the polyp (right of image) and low-profile elevation (left of image). Phonation with blurring, standard light. Six days after surgical removal. Prephonatory instant, standard light. Compare with photo 1. The patient continues to position vocal cords in a surprisingly separated position, as though the ghosts of the swellings remain. We call this “gap memory” or “posture memory,” though it is a manifestation as well of muscular tension dysphonia. Phonation with blurring, standard light. Compare with photo 2. Phonation, strobe light, open phase of vibration, at high G# (~831 Hz), just below A5. Even at this high pitch, both cords oscillate out to a full lateral excursion. Phonation, strobe light, closed phase of vibration, also at high G#. Since the patient is only six days postop, mild residual swelling is still present. More importantly, note that this “closed” vibration phase is not in fact fully closed, as further evidence of the patient’s “gap memory” and muscular tension dysphonia. Singing voice-qualified speech therapy and work with a singing teacher will address this. Close-range view with vocal cords in abducted position. This is not the best view to see translucence but faintly “grey” tone of polyps (circled by dotted lines) is indicator of translucence. As vocal cords are coming towards adduction, grey indicator of translucence. Similar view, with elicitation of rapid inspiration to reveal polyps better, especially on left (right of image). During strobe illumination, translucence especially of the right vocal cord (left of image), is seen best. Note that the larger polyp rides on the margin of the left vocal cord (right of image). Right vocal cord polyp (left of photo) and bilateral capillary ectasia. This young man continues to perform successfully but with increased effort, reduced endurance, impaired falsetto. 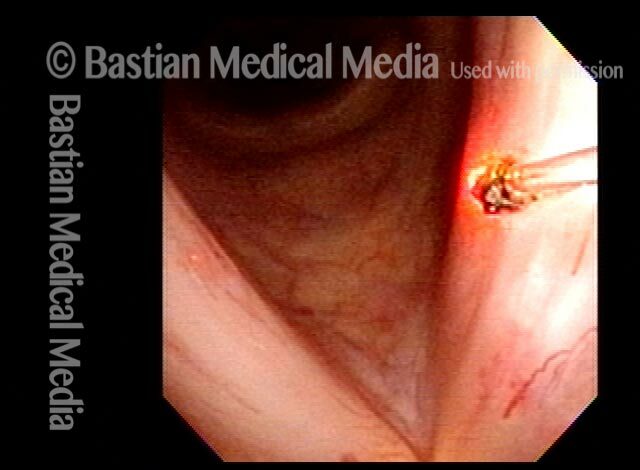 Prephonatory instant (standard light, just before vibratory blur) at high pitch to make the polyp maximally evident. One week after microsurgical removal and spot-coagulation of ectasia. Prephonatory instant at B4 (494 Hz) (compare with photo 2). One month after surgery, original vocal capabilities are restored. A tiny ectatic capillary “escaped.” It can be observed or spot-coagulated in an office setting using the pulsed-KTP laser. Strobe light, closed phase of vibration. This is performed at E-flat 5 (high falsetto), in order to maximally “reveal” (if present) vibratory stiffness. Open phase shows equal lateral excursion of both cords: there is no stiffness, and the residual irregularity is on the left (un-operated) cord (right of photo). Musical theater actress with chronic hoarseness due to this right vocal cord polyp (left of photo), first identified a year earlier and unresponsive to speech therapy. Magnified view shows small elevation of the left cord (right of photo) as well. Closed phase of vibration (strobe light) at B flat 5 (932 Hz). Open phase at same pitch. The next day, only a few hours after surgical removal. Note slight bruising from the endotracheal tube (long arrows), and small dots where a laser impact was used to interrupt flow in a prominent capillary (short arrows). Closed phase of vibration, strobe light, at D5 (587 Hz). Increased mucus is from endotracheal tube and surgical manipulation just hours earlier. Open phase, at same pitch. Subtle irregularities will “iron out” within over time. Voice is already much better (tested briefly because the patient is within the four days of voice rest, and then will gradually increase amounts of voice use for the subsequent month). Magnified view. Primary “wound” from polyp removal is at the arrows. Edema of the opposite side is from minimal trimming on that side. Chronic hoarseness in a singer. The obvious abnormality is on the left vocal cord (right of photo). When trying to make sound at high pitch, the polyp comes into early contact and interferes with vibration. Chaotic vibration will not allow full evaluation of the right (more normal) looking side. A week after surgical removal, voice is dramatically restored to the patient's complete satisfaction, and the vocal cord margins can match accurately, as seen under strobe light. Open phase of vibration at very high pitch, which the patient can now produce, reveals subtle margin elevation on the right (unoperated) side (left of photo). This is an example of how "the operated cord often looks better than the unoperated one." A vocal “overdoer” with hoarseness. Note broad-based swelling of both vocal cord margins. A micro-web, thought to be congenital, is also seen at the arrow. Tiny dots indicate a subtle wrinkle or shallow sulcus. The patient has been asked to produce inspiratory phonation to reveal the translucent polyp and “sulcus,” again at tiny dots. Under strobe light, the translucence of the polypoid elevation is seen more clearly. At open phase of vibration again under strobe light, the broad based left vocal cord elevation is also seen. 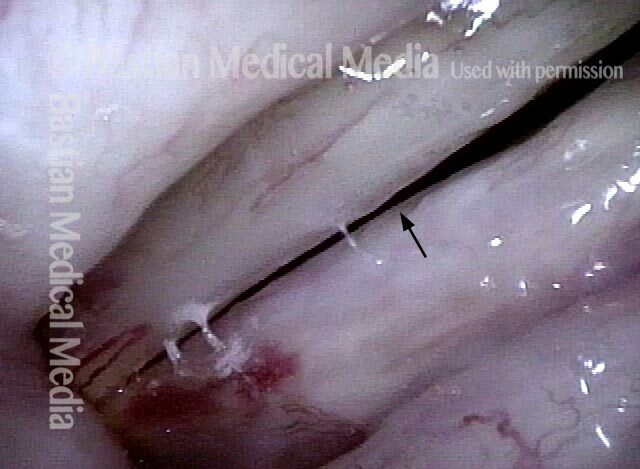 Vocal cord injuries of overuse are often bilaterally similar, but here we have two quite different expressions of injury: fibrosis and capillary ectasia on left (right of photo); translucent polypoid injury (not a cyst) on the right (left of photo). Now under narrow band light, the left cord (right of picture) has a flatter, fibrotic expression with tiny ectatic capillaries. Under strobe light, the translucent, polypoid nodule of the right cord (left of photo) distorts vibratory closure. This is the best closure this grossly hoarse person can achieve. This man is a singer. Distant "far" examination shows what appears to be a subtle or even inconsequential elevation of his right vocal cord (left of photo). Closer view shows the lesion better, but its true magnitude is about to be seen...when a truly close-clear view is achieved. Close-clear view under strobe light , falsetto voice, closed phase of vibration. The broad-based swelling is more clearly seen, between the two dots. Open phase of vibration again shows the injury. This young woman has been hoarse for many years. This preparatory posture shows marked separation of the cords posteriorly, suggesting MTD as well. Now producing voice, with vibratory blur of the entire length of the cords on both sides. Under strobe light at a lower pitch of A4 (440 Hz), closed phase of vibration. Large gaps anterior and posterior to the polypoid nodule(s) explain breathy quality and short phonation time. Open phase of vibration also at A4 (440 Hz) shows that the full length of the vocal cords are vibrating. Compare with the following two photos. Now at A5 (880 Hz), the patient can only make an extremely tiny (tin whistle) quality. The only segment vibrating is within the circle (here, closed phase). The posterior segment does not vibrate. Still at A5 (880 Hz), the open phase of vibration, again of *only* the tiny anterior segment. Patient comments about the improvement of voice after surgical removal of a vocal cord polyp. This entry was posted in Multimedia Encyclopedia and tagged Audio, Disorders, Photos, Vocal cord vibratory injuries, Voice & other larynx disorders by admin. Bookmark the permalink.